Is LA Really Going To Federal Court To Argue It Can Seize And Destroy Homeless People's Property? Dozens of downtown L.A. residents, business owners, and boosters packed a city council committee meeting this week to urge city leaders not to back down in a fight with homeless residents over their property rights. Voice after voice urged city officials to go to trial, rather than settle a federal lawsuit filed by homeless residents who said their constitutional rights were violated when their property was seized and destroyed. The suit, Mitchell V. Los Angeles, was filed two years ago by several homeless people who claim actions by L.A.'s sanitation and police departments violated their Fourth and Fourteenth amendment constitutional rights. The suit documents the experiences of four homeless people living on Skid Row. One of the plaintiffs, Carl Mitchell, claims the city confiscated and destroyed his possessions, following his arrest for allegedly stealing a shopping cart. He says he was released from police custody 18 hours later on a 40 degree winter night without his blankets, medication, and identifying documents. According to court documents, Mitchell slept that night on the sidewalk beneath a single blanket he found on the street, with no way to keep warm. Another, Judy Coleman, alleges that she developed pneumonia after the city impounded her blankets, medication, and walker. A month after the case was filed, a federal judge issued a restraining order against Los Angeles that effectively barred the city from conducting homeless encampment cleanups on Skid Row. Judge James Otero wrote in his April 2016 order: "To put it bluntly, Plaintiffs may not survive without some of the essential property that has been confiscated." The terms of the restraining order do empower the city to conduct cleanups in some situations, like if property presents an immediate risk to public health and safety. But the city is required to store confiscated property in a facility on Skid Row, and make it available within 24-hours of seizure. Conditions on Skid Row have visibly deteriorated since the city was barred from conducting cleanups there. Tent cities now cover most Skid Row sidewalks and spill out into other portions of downtown L.A. The conditions are objectively hazardous, a reality that appeared to drive people to turn out at Wednesday's meeting. Their fear? The status quo becomes permanent. That could happen if the city decides to settle the lawsuit and avoid litigation. But it could also happen even if the city decides to fight the suit. And it's not just downtown business interests or homeowners who want a better solution. Georgia Berkovich is the director of public affairs for the Skid Row-based Midnight Mission. Her organization opposes a settlement. "We believe that everyone in L.A. deserves to walk through their neighborhood without the threat of violence, assault or drug dealing," Berkovich said. "Every day we have almost 300 people who wake up in a safe place only to walk out into a neighborhood that is very dangerous." The Mitchell case is set to go to trial next year, unless the city opts to settle. Almost all of the speakers Wednesday explicitly urged the city: "Do not settle." General Dogon, a well-known activist and organizer on Skid Row, was the only commenter who spoke in favor of a settlement. Dogon is an organizer with the Los Angeles Community Action Network, one of the plaintiffs in the case. He said he believes L.A. would lose the lawsuit if the city takes it to court. "The federal courts have been consistent with upholding property rights," Dogon said. Dogon's organization would presumably benefit from a legal settlement reached in the Mitchell case. But beyond that, he argues seizing property unfairly punishes the homeless. "You have totally criminalized the situation, and it has gotten out of control," he said. Dogon and others argue that when homeless people lose their possessions and end up in jail it actually makes it harder for them to get off the street. For example, plaintiff Carl Mitchell lost documents crucial for accessing government services like Social Security, and needed dedicate the time necessary to procure new ones. Los Angeles has been sued several other times over policies that litigants alleged tread on the rights of homeless residents. Some suits ended with a judge's ruling, others were settled by the city. The result has been a disparate patchwork of rules and injunctions that create different standards of police and sanitation conduct based on where you live. 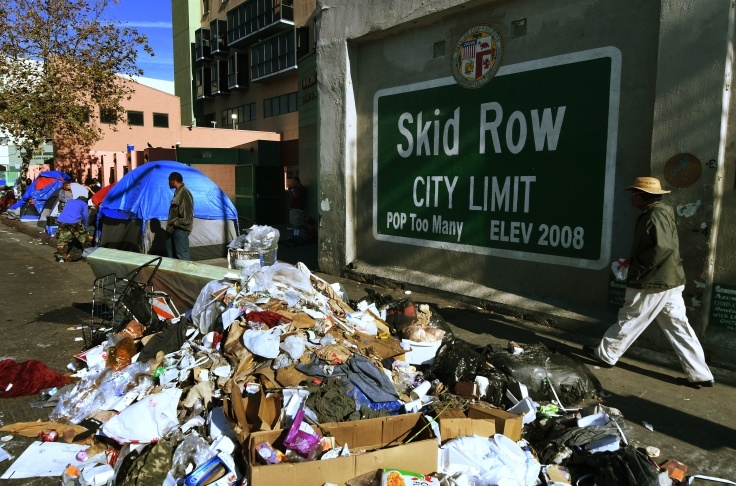 For example, while encampment sweeps are largely prohibited on Skid Row, L.A. has established a "special enforcement & cleaning zone" a few blocks away near its El Pueblo Bridge Shelter with cleanups five times weekly. That's partially why so many people are pushing the city to take the Mitchell case to trial. They hope a trial would establish a single citywide standard for encampment cleanups. The goal for advocates of this approach is a standard that allows cleanups to resume in Skid Row. In a brief statement after the public comment session, L.A. City Councilmember Jose Huizar affirmed his desire to take the case to trial. "If we are told that the chances of winning don't look good as we appeal and move forward, I'm willing to take that chance, and take that risk," he said. But there's a risk for those who want widespread cleanups. It's totally possible the court could side with the Mitchell plaintiffs. That could lead to more far-reaching limits on the city's encampment sanitation policies, and other public conduct laws homeless people are cited under. As a 9th U.S. Circuit Court of Appeals ruling against the City of Boise said earlier this year, "as long as there is no option of sleeping indoors, the government cannot criminalize indigent, homeless people for sleeping outdoors, on public property, on the false premise they had a choice in the matter."